Are You Getting the Most Out of Every Rep? Are you searching for that Missing link in your program? The Answer to what’s missing in their training program. If someone else is making faster progress than you, has a better body part, a stronger lift, they must have THE ANSWER. Certainly there is this secret formula to how people pack on muscle easily and bring up lagging body parts. I’m going to tell you the secret, but it’s not what you think. It’s not a secret workout system, advanced program, or the next new supplement. The ANSWER is, master the fundamentals, exercise execution. There are plenty of details you can focus on in the gym. Picking good exercises, how many reps/sets your are doing. Optimizing your programming is a good idea if you have the time and energy. However, these training details are mute unless you can firmly answer the question: Are your reps actually making you better? Take it from one of the greatest athletes that has ever walked this earth. They key to getting the most out of every workout is making every rep count. See a person with a great body part, I guarantee you, they are great at contracting it. See a person with a weak body part, they probably don’t contract it well at all. Regardless of the exercise, if you haven’t mastered the art of maximizing a muscle contraction, you’re leaving muscle tension and therefore results on the table, every rep. It doesn’t matter how hard or how often you train if you haven’t mastered the fundamentals of exercise execution. When you start improving your fundamentals and improve exercise execution, tiny improvements add up to significant gains. So what are the fundamentals needed for excellent execution? If you don’t understand the direction a muscle pulls, and the two points it approximates, you have no idea if you’re optimally loading that muscle. This is way more complicated than what you think. Individual variances play a huge role in knowing what is an optimal movement for you versus the next guy/gal. Learning to conceptualize muscles in 3D and as they move is very different than the anatomy coloring book you filled out in class. This is about understanding basic mechanics and the application of force. You don’t have to a renowned physicist, most of these concepts are common knowledge, but very uncommonly considered when training. This is the biggest difference between training for an external result (weight being moved) and an internal result (muscle tension & hypertrophy). Instinctively our bodies want to do things the easiest way possible. Our ego’s like to go along with this. But how much weight you’re lifting is insignificant without first considering your execution. They key to growing muscle is making the exercise as much work as possible for the targeted muscle. This goes against all instinct. You’re making the exercise as hard as possible. That’s what stimulates growth. Understanding how to manipulate body position, tempo, and isolation techniques will allow you to grow any muscle, as fast as your recovery allows. Improve your mind muscle connection, and intensity of contraction. A huge key to improving your execution is developing the feeling, and awareness of what’s working and how hard it’s working. If you have never truly isolated a muscle, you may be mentally numb to what it’s doing. How then can you know if it’s working, and if you could be working it even harder? You need to develop the skill of being able to maximally contract a muscle. Improvement in this skill is what actually leads to almost all initial strength gains when a person starts lifting, or a new exercise. But you have to take it even further. You should get to the point where you can maximally contract a muscle on command, regardless of the exercise. Michael Jordan didn’t have to think about his technique when throwing up a jump shot, Mohammad Ali didn’t have to think about throwing a punch. They mastered the execution of these skills to the point they were thoughtless. If your goal is to build a muscle, your skill is being able to selectively contract that muscle on command without having to waste effort thinking about it. Then when you load that muscle, you will produce massive amounts of hypertrophy inducing tension. The greatest coaches obsess over the fundamentals. Phil Jackson, Bill Belichick, Vince Lombardi. Coach John Wooden won ten national championships at UCLA in twelve years, making him arguably the greatest NCAA BB coach ever. All the best young basketball players in the world wanted to play for Coach Wooden. But you know what he would teach them on their first day of practice? How to put on their socks correctly! The most disappointing athletes are those who have the most amazing, unparalleled raw talent, but for lack of focus, motivation, or just simply ego, fail to recognize the importance of the fundamentals and master them. This is why we created our Level 1 MI40 Muscle Camp. No one needs to waste another hour in the gym again. 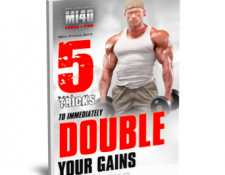 In 3 days, we will teach you the fundamentals for executing muscle building contractions in all the major body parts. This camp has been a game changer for the hundreds of students who have already experienced it, and have come back again and again. Click the link below to learn more about the most important training experience of your life. I'm about to share the 5 secrets to your next growth spurt breakthrough! You won't find these unique science-based gym-tested techniques anywhere else. Introducing NOS - the intensifier to guarantee max muscle size and so you never say, "Did I do enough?"